Certain volcanic eruptions, such the one at Mount St. Helens in Washington State in 2004 -2005, which the authors from the Ural Federal University in Yekaterinburg studied, are marked by a regular drumbeat of small earthquakes. In Calbuco last month, there were scores of tremblers of up to 3.6 in magnitude before the volcano finally exploded. However, why this occurs is poorly understood. “Volcanoes are considered chaotic systems. They are difficult to model because the geophysical and chemical parameters in volcanic eruptions exhibit high levels of uncertainty,” admits a statement from the Yekaterinburg team, which has published its findings in The European Physical Journal B. Unable to reach inside the volcano itself, volcanologists believe these precursor earthquakes are caused by a phenomenon known as stick-slip behavior. Imagine dragging a heavy box along a rugged surface by an elastic cord – as you pull, the cord stretches, but the box does not move until the cord reaches a certain level of tension, after which the box suddenly jerks free and moves. To force the box further, this process would be repeated. The same motion could be happening inside the volcano, with the magma rising from the depths pushing the volcanic plug up in these stutter steps, moving it by perhaps less than 0.5 centimeters each time. The Yekaterinburg team decided to test a mathematical model of this stick-slip motion, but also added another factor – outside noise projected onto the volcano. What they found was revealing – not only did the noise contribute to the oscillations, but relatively small sound waves could produce a disproportionate destabilizing effect, with the volcano seeming to dance to the beat of the white noise coming in from outside. The team now hopes to apply their findings in a practical area – forecasting eruptions, by understanding the mechanisms within volcanoes. They admit, however, there are still too many variables to be able to use mathematical models like theirs to predict real eruptions. 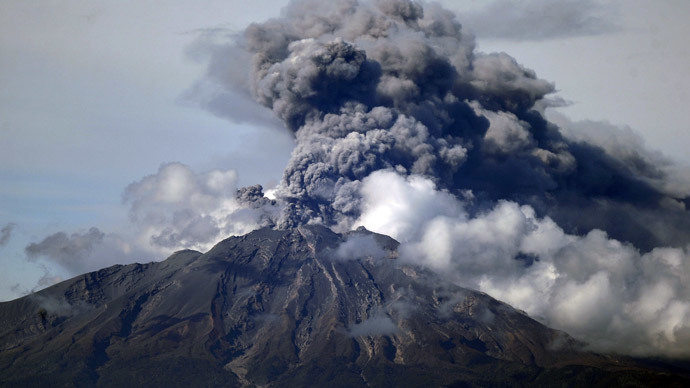 “Predicting when, where and how volcanic eruptions will happen is likely to remain empirical. That is, until it is possible to improve the modeling of their dynamics. The challenge of such models is that the volcanic eruption dynamics are very complex, involving simultaneous unrelated processes and offering a variety of possible scenarios,” the Yekaterinburg volcanologists said in their statement.